I created this e-commerce website and business. A partner and I were excited about the emerging smart phone market and created a site to sell educational training products to on-the-go professionals. The e-commerce site sold digital downloads formatted for a dozen mobile platform and screen sizes. I set up the content management e-commerce site (Prestashop), created a custom design, managed sales and customer support, and created a dozen products for the site. We launched the site, made enough sales to prove the concept and get market feedback, then sought investor funding. Our plan was to set up a system that allowed us to be able to reformat all existing products to fit new mobile devices as they are released, and have them available for sales the day a new hand-held went on the market. This required capital and we were unable to raise money to make this happen. The site is still running, but we are no longer marketing it or developing new products. I created this e-commerce website. This unique product had need of a custom purchase process. I worked with a brochure designer, and adapted his design to the website. Once launched, I managed the site and orders. The site is no longer online. I do not come from a traditional Computer Science background, and programming for me has always been a skill I picked up to solve problems. I have created desktop applications in Visual Basic, Java, and half a dozen other odd platforms, but my go-to tool is Adobe Director. In the early 90's when I started out, Director and CD-Rom's were king. As the era of the CD-Rom diminished and the web took over, Director has found odd little places to thrive. Two places where it excels is in cross platform, media rich desktop applications(including kiosks), and application prototyping. The good thing about a program that's almost 2 decades old is that is very stable, well documented, and there are lots of books available. This company had an existing piece of software and they were looking to update it. The software was designed to give teenagers and young drivers a glimpse into the negative consequences of drunk driving. 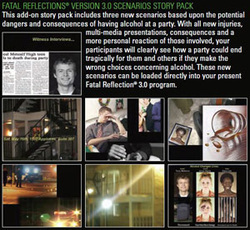 It did this by allowing users to import a photo of themselves and the software would superimpose wounds over it simulating that aftermath of a crash. It also included a one page description of the circumstances around the accident and the physical, emotional, and monetary consequences that you could print out along with the picture. 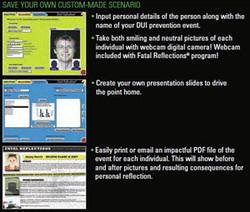 Initially they approached my partners and I to update it by adding a live webcam to capture the head shot images. We countered with a grander vision. We felt that if the goal was to make a bunch of jaded teenagers pay attention we needed to involve them more in the story. Our idea was to create little 3 minute multimedia stories that would include dramatic performances, video, pictures and text. In the setup process, we would take information about the user and photos of them and their friends, and weave them into a dynamic customized stories. They went for it, and we were on our way. The team consisted of three, a project manager, a writer/video producer, and a designer/programmer (me). 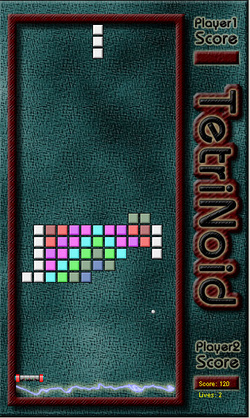 Scripts needed to be written, actors voice over recorded, and sound effects edited in. A variety of webcams had to be purchased and tested. The project was a radical enough change from the previous version, that the code base had to be almost entirely rewritten. It was a big job. The project went into development, but hit a snag shortly into the process. Our writer went in for a routine outpatient surgery and ended up in a coma for two weeks. This and a few other technical issues pushed the development schedule out, but ultimately we turned in a great product overtime, but on budget. About a year later, they came back to us to create an 'add-on pack' of scenarios. Both these products continue to be good sellers for the company and are well received by the public.